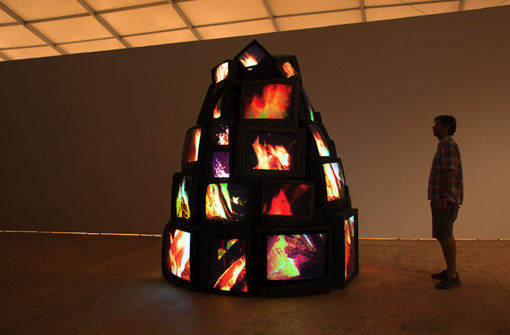 Kevin Cooley is a visual artist working in photography, video, and public installation. His work examines the interaction between the natural environment and the one that we fabricate. Making use of unusual or overlooked moments in everyday life, his work becomes a meditation on our evolving relationship with technology, nature, and ultimately with each other. Cooley received a MFA in photography from the School of Visual Arts, New York City and will have his first solo museum show at the Museum of Photographic Arts in San Diego, this fall . His work, Remote Nation, (comprised of 100 analog TV sets placed throughout a vacant NYC apartment building and playing programs controlled by his father’s remote control in Colorado) was recently on view in New York, seen from the High Line and his large scale video installation Skyward is currently on view at Peirogi's The Boiler in Williambsurg, Brooklyn until March 17th, 2013. He lives and works in Los Angeles.